Eye-catching trade show booth design that is customized to match your branding and will be the show stopper needed to bring potential new clients to you. Vinyl Telescopic Backdrop Banners – Display brand messaging, event backdrops, vinyl trade show signage and more in a flash! Includes telescopic backdrop banner stands! Portable and easy to set up, these durable and waterproof banners are ideal for use both indoors and out. Indoor Banners with Retractable or Collapsible Stands – Great for POP displays, artful decor, indoor banners and more. The material has a smooth matte finish which offers high print quality and versatility. It is not waterproof or scuff resistant. Table Covers – Table Runners will add a finished professional look to any table display, trade show booth, or special event. They are 100% polyester, wrinkle resistant and printed using a superior quality dye sublimation process. Table Top Retractable Banner Stands – Maximum impact with minimal effort! 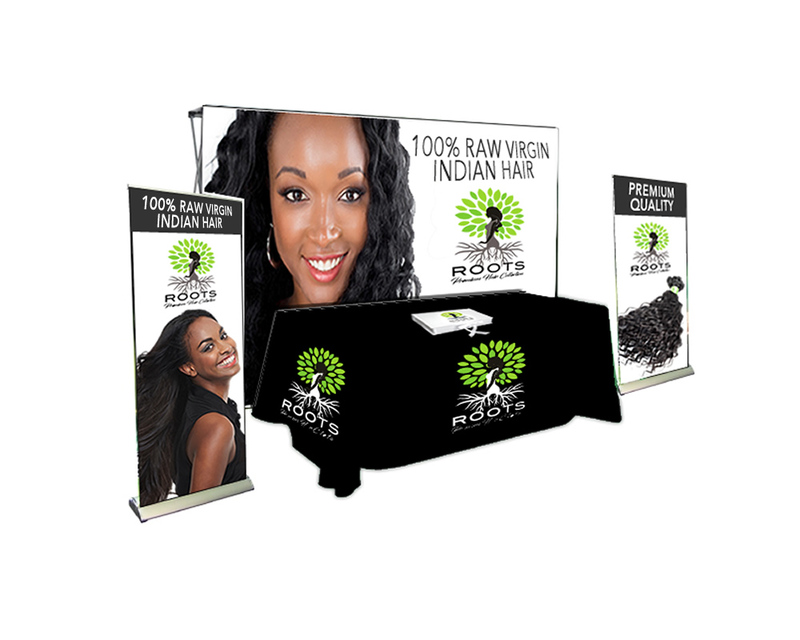 Instantly promote brands and more with tabletop retractable banner stands. Perfect for customers on the go! Available in a variety of sizes designed for tabletops, this product is ideal for pop up displays at trade shows, university orientations, and indoor events of all kinds. Outdoor Banners – Outdoor Banners can be used for billboards, building wraps, banners, trade show signage and more. Waterproof and durable use them outdoors and indoors. Backlit Posters – Backlit Posters allow customers to create messaging that lights up and stands out with vivid backlit graphics and superior light diffusion. Our banner stands are portable and easy to set up, these durable and waterproof banners are ideal for use both indoors and out. Our expert trade show booth design team will handle everything from concept, to design, and printing. We handle everything from start to finish. With the high volume of printing we do each month we can provide our clients with the unbeatable, wholesale costs. WE NEVER MARK UP PRINTING COSTS! YOU PAY WHAT WE PAY!